Java is a critical part of your online classroom experience. However, recent security concerns surrounding Java mean you may run into problems with the Java plug-in. We have found this is particularly an issue in Firefox. To get Java working correctly, first open up Internet Explorer. Go to: http://java.com, then click on the “free Java Download” button. If you have the latest version installed, you should get the “Congratulations!” message on your computer. You should be all set to go into http://knowledge.udmercy.edu using Internet Explorer to access your Collaborate or Wimba sessions. Under the “Activate All Plugins” dropdown menu, select “Always activate plugins for this site”. This will activate Java for the site you are currently on. You will need to do this when you launch a Wimba or Collaborate session in Blackboard. When you are signed into the http://knowledge.udmercy.edu site, you may see a little red block that looks like a lego in your url bar when you launch a Wimba or Collaborate session. 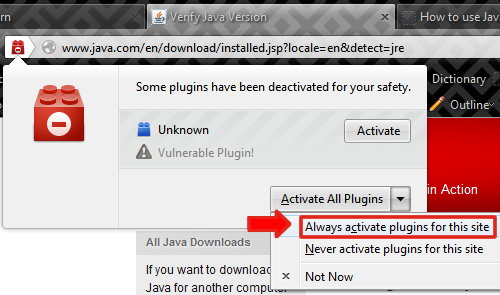 Remember to click the “Activate All Plugins” dropdown menu, select “Always activate plugins for this site” to activate the java plugin for the website.